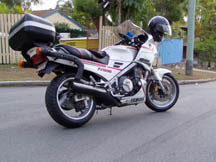 Just bought a 1985 FJ 1100 From Melbourne so its not even in my Garage yet as its on route on the back of a truck . Welcome Macca, you are in good hands with the strong Aussie team we have here. Good to see you found 1 finally. Love to go for a midweek ride BUT I’m in Sydney. Do you think you’ll have it ready for a run in March to the Annual Rally in NSW? Maybe that could be a test ride before the VJMC Annual Rally at the Gold Coast in May? Two of my bikes came from Adelaide! They're full of red dust in hard to reach places, so must have been out of town a bit. Like Al, I'm over east as well, but there are a few FJ brothers in the City of Churches. Welcome to the crazy house Macca. Always good to have a new rider surface. I'm in Brisbane so a ride for now will have to wait..
and hi five to sparky84 not sure about making all the east coast rallies but never say never ! Welcome Macca. I know there are a few South Aussie guys about. Some of them got together a few weeks ago for a ride. If you do the Fakebook them, they are on there. Would be nice to see you at a rally, but no pressure. Hi ya Macca.. Welcome to the place that will put amazing, crazy ideas in your head!! You will have all sorts of mod's going on in no time at all!!! Im over the other side of the country but always good to see the mighty FJ population growing.